I’m not very tech savvy. I own a phone, a laptop, an iPod–no other gadgets. On our runs, I rely on Ivy and her mighty Timex stopwatch to judge my efforts. But with my Timer on a trip this week, I had to hold my phone in my hands on my runs (running with the phone in my shorts pocket almost pulled my shorts down)–a real drag. I started wishing for my very own timer watch. All I need, I tell myself, is a simple sports watch. No fancy features needed. Simply googling ‘running watch,’ I was astonished by the plethora of sport watches available, each with a more advanced feature than the other models. Amazing what can be measured by a little wrist watch! I’ve been living under a rock (well, I suppose I do live on one.). 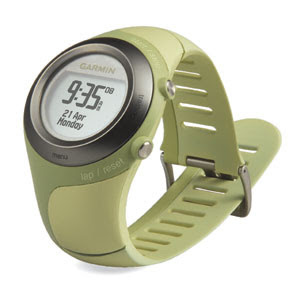 Sport watches these days not only tell time, they monitor heart rate, calories, pace, distance, location, temperature. It’s far from being just a watch as I know it; it can be a GPS, a barometer, a personal trainer. Certain models can calculate mile splits and even wirelessly transfer data to a computer to be reviewed and analyzed. Of all the watches I researched on, the Polar RS800 has the coolest features, although the watch face is likely twice the size of my wrist. It is probably too fancy for a recreational runner like me. But a girl can, and should, always wish. I ran our club route again today, and even though my legs didn’t experience the same pump of strength like last week (I didn’t have a ‘haute’ dog last night), I managed to shave another 3 minutes off! That’s a whopping near-6 minutes from the inaugural run!! I’m ecstatic. I felt so strong that I even ran an extra cool down mile. After Ivy’s trip, then it’ll be my turn to take off for a month. I hope I can still run. I will. Calling runners. This week, 7/12, we’ll be running at 6:00 AM. We’ll either do our 6 mile route from the (missing) mile 8 marker, or we’ll start at Kapiolani Park and do a 6.7 mile route. Leave me a message if you can come join us. It’s been a busy week. Busy working, busy barbequing, busy celebrating a very happy 4th. I ran only once this week, but it was a decent speed workout at the track so I am glad to give my legs a break. With all the rustic, hearty steaks, wings, hot dogs all washed down by cold beer, I tried out more delicate flavors earlier in the week. 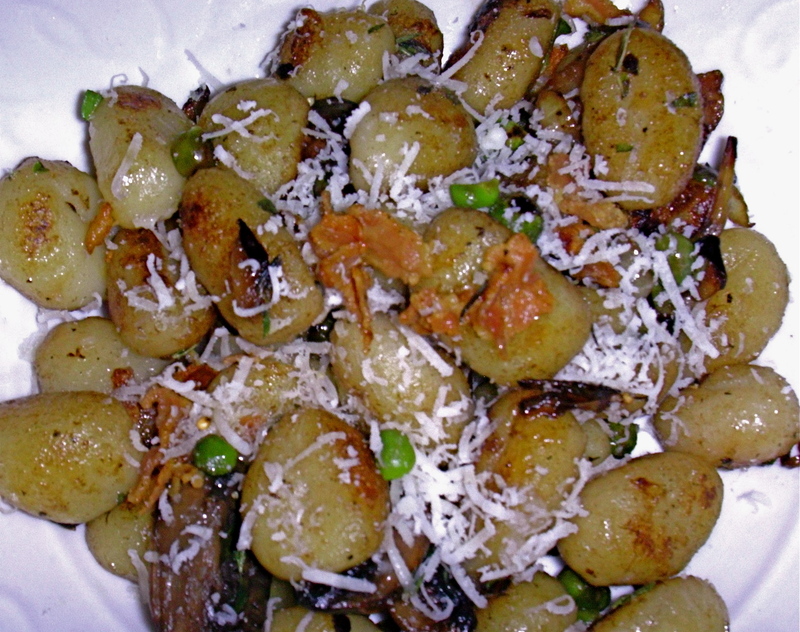 My latest favorite dish is pan-fried gnocchi, which I have had at several restaurants recently. So I recreated the dish with a few different ingredients. After a rather rough and angry day at work, I couldn’t wait to get home and start cooking. Food is comforting, cooking is cathartic. I soon forgot that I was angry. The whole meal took less than 45 minutes to make. My debut try with those little pillows was much easier than anticipated. In addition, I made my friend’s creation of a spinach bruschetta topped with pecorino romano. Delicious food, bountiful wine, and great company made my evening. I look forward to getting back on the road next week.